The 2017 NCHA Futurity Select Yearling Sale, on Wednesday, December 6, completed sales on 88% of its offering, an all-time record for the sale, where 42 head sold for $2,424,000 and an average of $57,714. 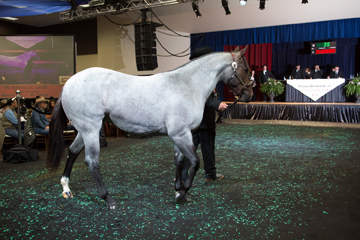 Nu Metallic Lace, consigned by Eddie Longley, topped the sale at $250,000. The bay roan filly, sired by Metallic Cat, was purchased by Circle Y Ranch, Millsap, Tex., home of Im Countin Checks, the sire of 2017 NCHA Open World Champion Deluxe Checks. Out of Nu I Wood LTE $427,152, an NCHA all-time leading producer, Nu Metallic Lace is a half-sister to NCHA Open World Champion Special Nu Baby $LTE $481,197 and a three-quarter sister to Special Nu Kitty LTE $301,268. Metallic Mystified, by Metallic Cat, was the second-highest seller of the sale. Consigned by Fults Ranch, the bay colt brought $200,000 from Rocking P Ranch, owner of 2017 leading sire Metallic Cat. Out of Sweet Abra LTE $120,151, an NCHA all-time leading producer, Metallic Mystified is a full brother to Metallic Rebel LTE $404,910, 2017 NCHA Horse of the Year and 2017 World Champion Stallion. Rocking P Ranch, Fort Worth, Texas, also purchased One Time Pepto daughter Foxing Awesum for $150,000 from Waco Bend Ranch. The red roan filly is out of Dont Look Twice LTE $843,096, NCHA’s all-time leading female money earner. Her second dam is Tapt Twice LTE $285,226, a Top 10 NCHA all-time producer of the earners of $1,459,206. Lou Rey, by Dual Rey, also went to Rocking P Ranch for $100,000. The Oxbow Ranch-consigned filly is out of Louellas Cat LTE $305,305, a full sister to Cattalou LTE $286,647 and half-sister to Movin Downtown LTE $346,715. Shameless, a Dual Smart Rey daughter out of Miss Pepto LTE $100,727, by Peptoboonsmal, sold for $110,000 to John Thomas, Alberta, Canada. The red roan filly was consigned by Crown Ranch, Weatherford, Tex.